As I mentioned in the previous post about our last peonies to bloom in our full sun field, oh but what treasures were found in our north facing field! Micro-climates are a peony lovers BEST friend! Being able to extend the peonies bloom time is wonderful! 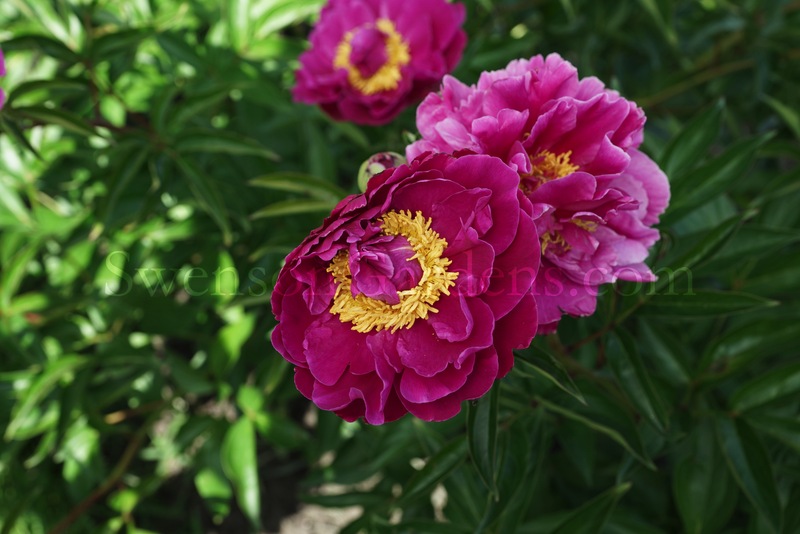 I’ll go into more detail regarding micro-climates and peonies in a future post. 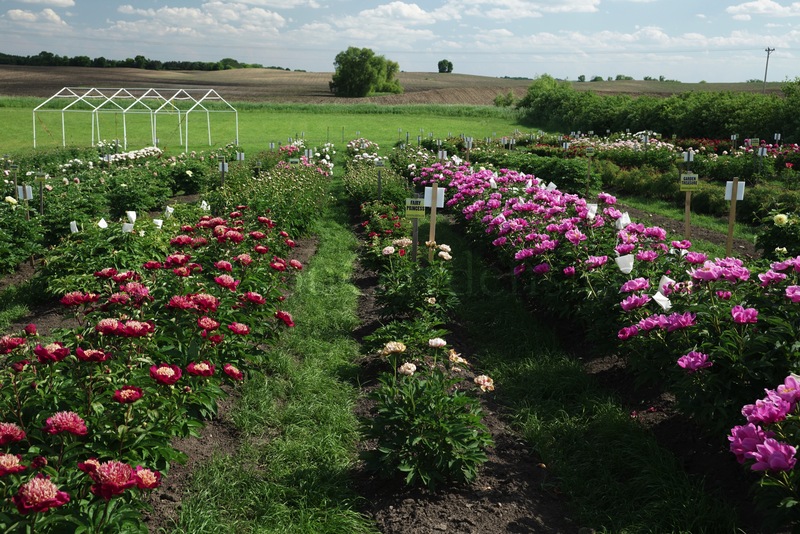 So for now if you were not able to attend our Peony Field Days, envision a sloped area facing north. 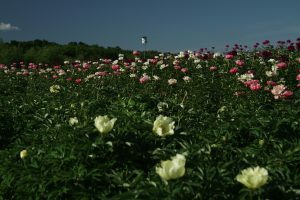 Every peony at the top of this hill facing south receives full sun. The ‘treasures’ were found at the bottom of this hill facing north. Most of the peonies in this area receive some shade in the ‘hot’ afternoon and throughout the evening. 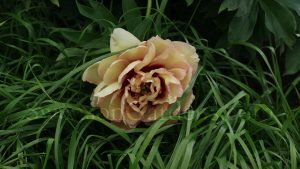 The other aspect regarding these accompanying pics is the fact that the ‘treasures’ were all intersectional hybrid/Itoh peonies! 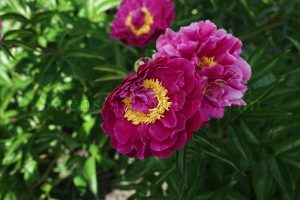 Yes dear gardening friends, intersectionals are amazing peonies to have in your gardens! 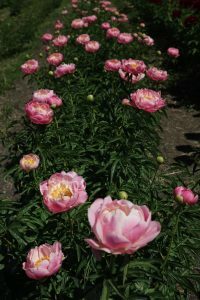 Unlike herbaceous/lactiflora peonies that for the most part, bloom all at once, intersectionals bloom for an extended period of time with both their primary AND secondary buds. 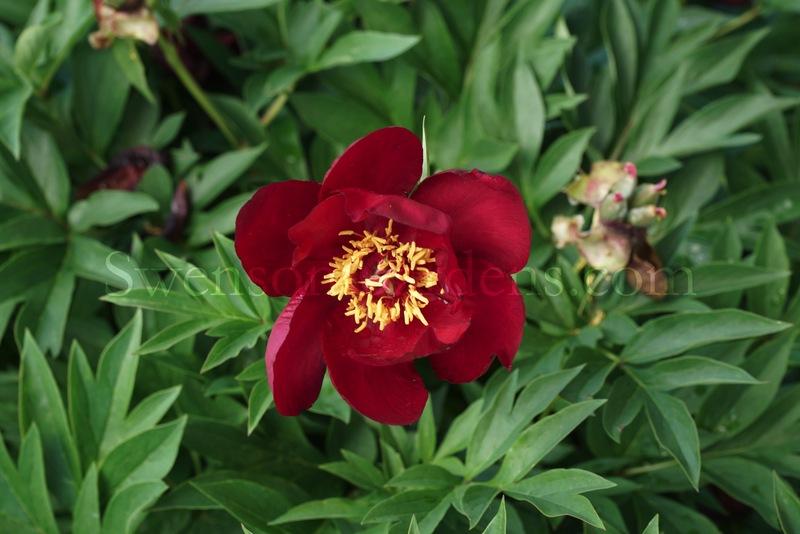 One of the easiest peony bloom to spot from a distance away is Bartzella. Continuing down the row, WOW what is that intersectional peony blooming? Holy cow is that gorgeous! The unmistakable, Royal Blush was tucked away on the northeast side of the plant. Yes peony gardening friends, a micro-climate within a micro-climate! Not only is this portion of the peony field a micro-climate but knowing this side of the individual plant receives less sun, may I submit to you, another micro-climate! 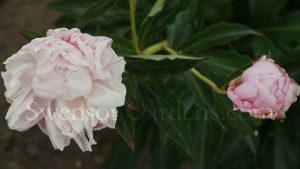 So enjoy this pic below of the intersectional hybrid peonies called, Royal Blush! Ok so these intersectional hybrid peonies have thrown up blooms over the past 3-weeks at or near the top of the foliage and only an hour or so ago did I find/notice these blooms? Of course its hard to see the lower blooms until I decided to take one last stroll through the peony fields with the Sony. 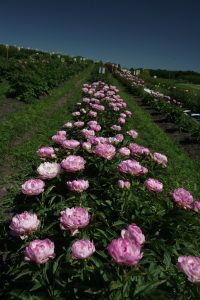 Looking over at another row of intersectional hybrid peonies revealed multiple blooms located on the northeast side of the plants. For all the years we’ve had peonies growing in this field, why didn’t I notice this before? I know original bare root-stock intersectional hybrid/Itoh peonies have an extended bloom time, but 4-weeks of blooms if you look closely? Well I am now a firm believer of micro-climates within a micro-climate especially on the northeast side of the plant! I’ll leave you with this final shot of Norwegian Blush below that is normally one of the earlier blooming intersectional hybrid/Itoh peonies. 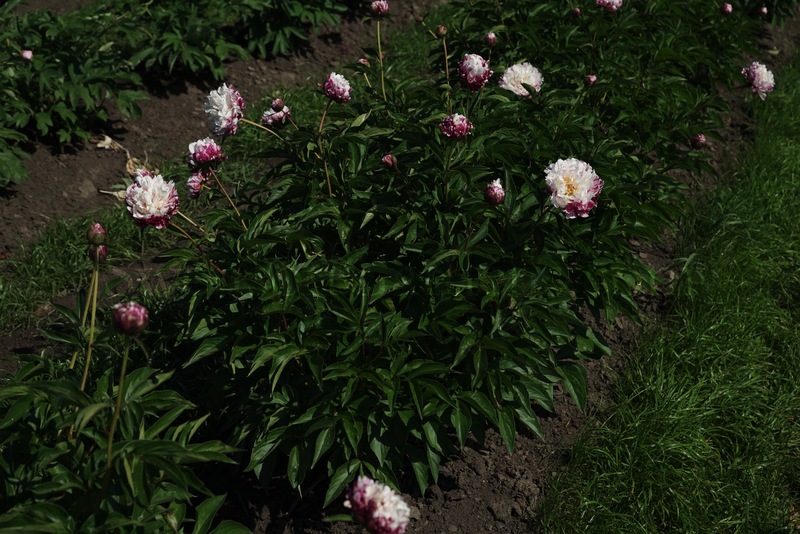 Micro-climates within a micro-climate for intersectional hybrid/Itoh peonies…you betcha! THE LAST PEONIES BLOOMS HAVE ARRIVED FOR 2017! And the winner of the last peonies bloom for 2017 is Ruth Cobb! These pics were taken about an hour ago in our full sun field. She was a bit tattered this season due to the above normal temps during bud stage but cutting her in the marshmallow soft bud stage provided us with many days inside of vase enjoyment. Many gardeners forget the very late blooming peonies so give her a try in your gardens and for sure inside, in your vases! 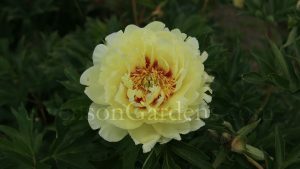 Oh and by the way, Ruth Cobb does not need staking so she is a welcome member of Swenson Gardens ‘growing peonies that don’t flop’ star cast member! 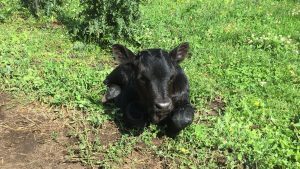 As we wind down the peony bloom time for 2017, there is another new arrival on the peony farm. 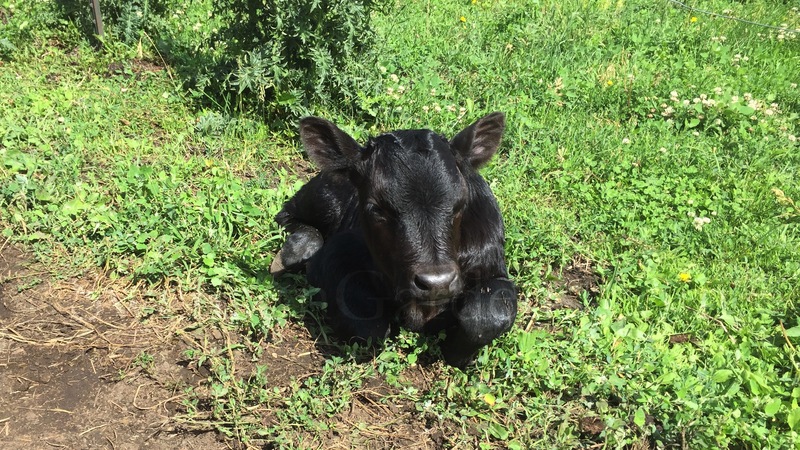 Tabitha (just Tabitha) blessed us with a new member of the fertilizer production team (FPT). 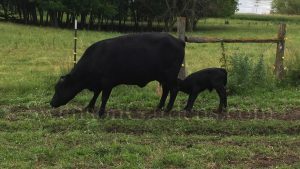 Yes a healthy baby bull was born on Wednesday. Tabitha is one of our better ‘mothering’ cows and he was soon up and having a feast from her very nutritious milk. Always fun to see the milk mustache after their feeding time. So far this spring/summer we’ve had five new members to the FPT. 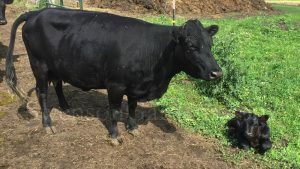 One more cow to go and the new members of the FPT will be done on the peony farm for this year. 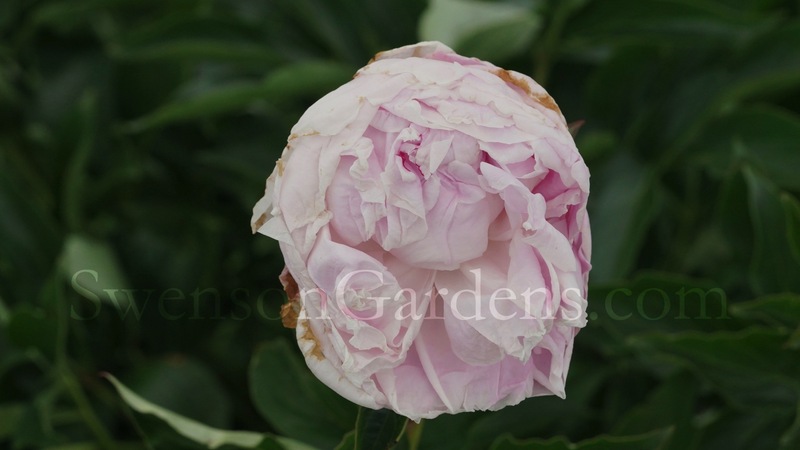 Ok from time to time we are asked ‘what is the most fragrant peony we grow?’ Of course fragrance can be different for all peony admirers but the top of our list is ‘Rose Pearl’. Yes a few of them were in bloom during Peony Field Days but last night Becky took this pic below as she was in peak bloom! Besides her fragrance, she also has stiff stems, extended bloom time and wonderful foliage. Just a hint that we only have a couple of dozen left for 2017 so if you are looking for a late blooming soft pink peony, ‘Rose Pearl’ is a must have for your peony garden! Thank you to the 1500+ peony admirers who came out on June 9th and 10th to view our peonies! Are we all nuts or what? You gotta love peony admirers…WE LOVE PEONIES! For those of you who attended last year, remember the flooding we had getting into our fields and driveway? Then a few years ago we were wearing winter jackets and rain gear? And then 2017! ‘Where’s Dorthy?’ was the theme yesterday morning with gusts up to 45 mph and topping the afternoon off with 90 degree temps. Yes we peony admirers are nuts but you have to do it! All of you who attended yesterday were amazing! 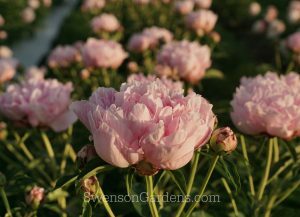 Sure it would be nice to walk through a climate controlled greenhouse, but to see first hand how our peonies held up in the wind means ‘no staking’ in our peony varieties descriptions. 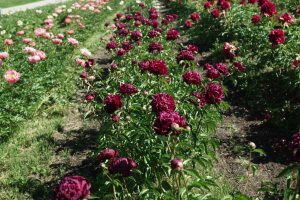 You may be wondering how our peonies look after the storm that went through this morning, well the picture below will give you an answer. 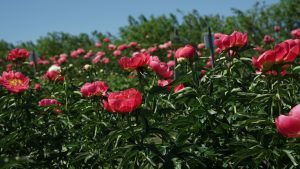 2017 Peony Field Days is over. We look forward to seeing you again if you will be picking up your orders on September 15th and 16th, 2017. 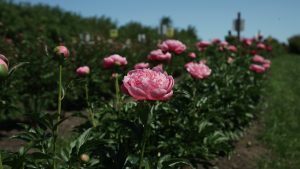 Otherwise do make it an annual event to come out to our Peony Field Days! We hope you had a great time and enjoyed your visit. Our online store, mail order and phone orders are still open. Make sure to check availability of our peonies online as some peonies will be sold out after we update our inventory. Again, thank you to all who came out to our Peony Field Days to view our peonies! Thanks again for all of you who came out to visit our peonies today! The color in the fields for mid and late blooming peonies are still at peak and should look wonderful for our final day of Peony Field Days on Saturday, June 10, 2017. Please note we are not open after June 10, 2017. Friendly reminder that we are opening up our fields at 7:30 am and closing at 3:30 PM due to the extreme heat. The peonies will be waiting for you and we are too! My, my what a difference in field color of the peonies that were in bloom a week ago! Thankfully the thunderstorms missed us late yesterday but the extreme heat has launched our bloom time full speed ahead. For those of you who attended last week we were in the early and early to mid bloom time. We are now at the mid to late and some late bloom time. My guess is that some of the lates will start showing in the afternoon. The intersectional hybrid (ITOH) peonies are really showing their spectacular colors and yes Chief Black Hawk is blooming as noted in the photo below. With most of the intersectional hybrid (ITOH) peonies, they have an extended bloom time due to the primary and secondary buds that bloom at different times. 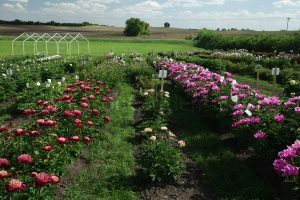 With three different fields to view intersectionals, each field, and in some cases the north side of the field is behind the south side, has them in different bloom stages. If you haven’t tried intersectionals yet, now is the time to see most of them in bloom so you can choose a plethora of colors and plant habitat. Foliage rules with intersectionals as they retain their shrub like appearance well into the fall. 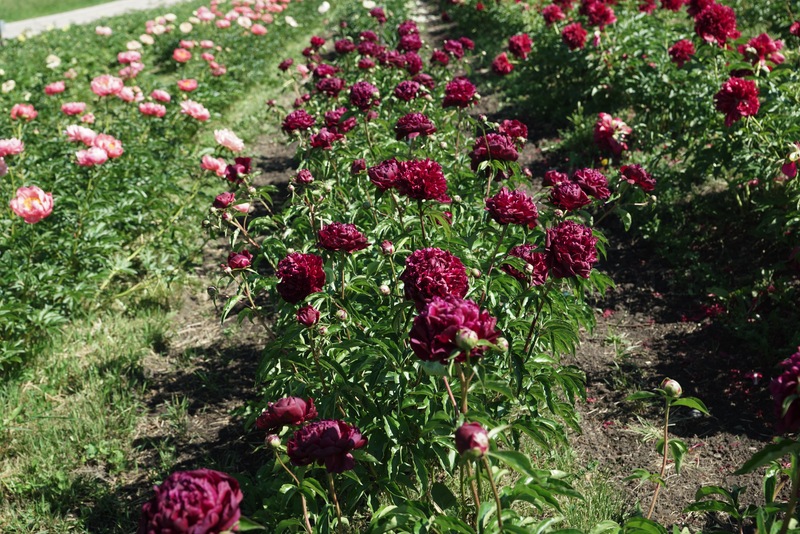 As I was walking through the fields tonight, a row of dark red garden peonies caught my eye. In the photo below, Highlight will be showing off over the next couple of days. Red Charm is on the right of this photo so Highlight really provides a different shade of red next to each other. 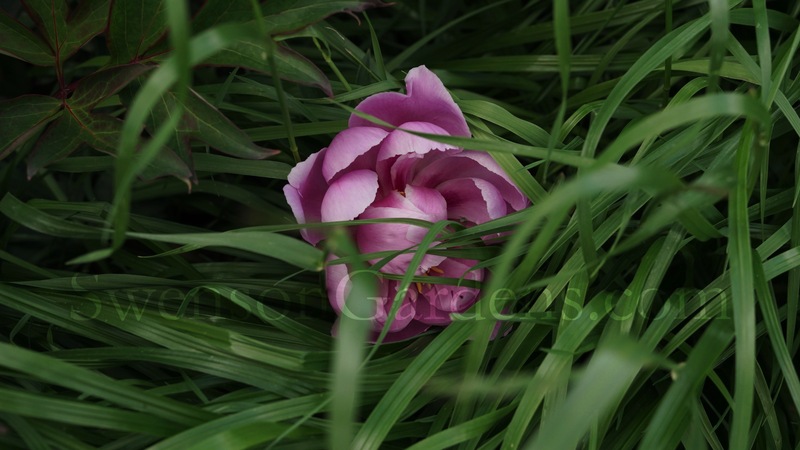 Roaming through the field to the east of our driveway also revealed another garden peony called ‘The Mighty Mo’. This use to be the favorite color of the wholesale buyer of our peony cut flowers when we use to sell them. Our most popular peony below called ‘Candy Stripe’ is in peak bloom over the next couple of days. Again you will see different bloom phases of Candy Stripe in the various fields. 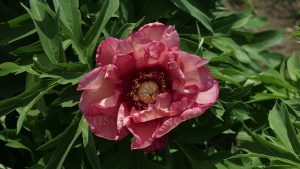 For Friday, June 9, 2017, we will be open from 9 am to 5 PM for viewing our peonies. The fields and transition areas are dry so boots are not a necessity. With the 1/4″ of rain late yesterday, guess who started to view the peonies? Yes the way too friendly mosquitoes have arrived. With the wind though, they shouldn’t be too much of a bother but if you do need to put on bug dope just in case, make sure to spray in the parking area and NOT in the fields! Again we are a pet friendly peony farm as long as the owner is on a leash but with the high temps, make sure they have enough water and DO NOT leave them in your vehicle! Might be better with this heat to leave your pets at home but please note that their owners are very welcome! 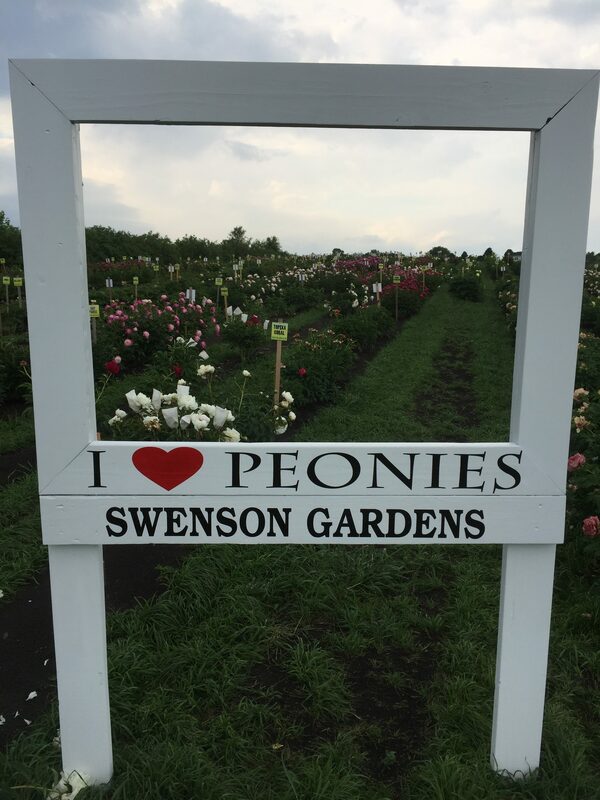 If this is your first visit to Swenson Gardens Peony Field Days, our address is 10958 70th ST SW, Howard Lake, MN. For insurance purposes we do have to state that we will not be liable for any loss and/or injury on our property so please be careful! With the extreme heat forecasted for Saturday, June 10, 2017, we will open from 7:30 am to 3:30 PM. We want all who are attending to be safe in these temperatures so make sure to bring plenty of water and sunscreen. We do have a mini biff in the parking area. For those of you who want to enjoy the peonies from a vehicle, it is ok to drive north on our driveway and turn around on top of the hill past our home. Please do not park in any areas other than our parking lot that is located directly east of our driveway as you turn north off of 70th ST SW. For those of you who will be walking, after parking your vehicle, go west towards our tent where more information will be given to you as well as a field map. Have a safe trip and can’t wait for you to see the peonies that are in bloom! 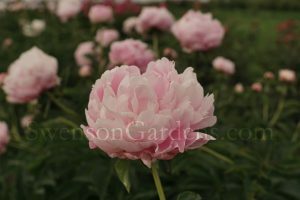 Please note the time change for viewing our peonies on Saturday, June 10th. We will be open from 7:30 am to 3:30 PM due to the extreme heat! The late blooming peonies have yet to bloom but that can change quickly with the heat wave that has besieged us! 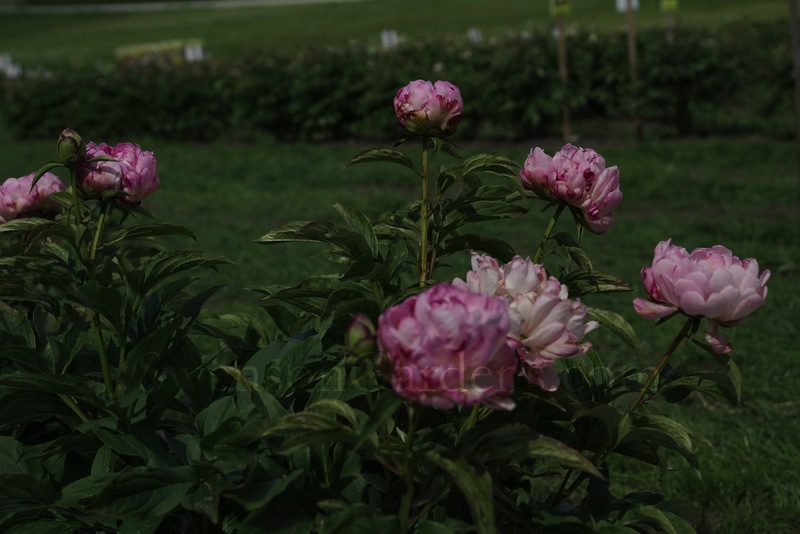 Thanks again to over 1,300 of you who stopped out to see our peonies on the June 2nd and 3rd Peony Field Days! Amazing to experience first hand what a couple days of 90 F and full sun does to peony blooms. What the fields looked like Friday morning versus Saturday afternoon was almost night and day. Corals started popping Saturday and even some mids started to show. Here are some pics taken Sunday, June 4th. Petite Elegance wowed us with her peony blooms display. 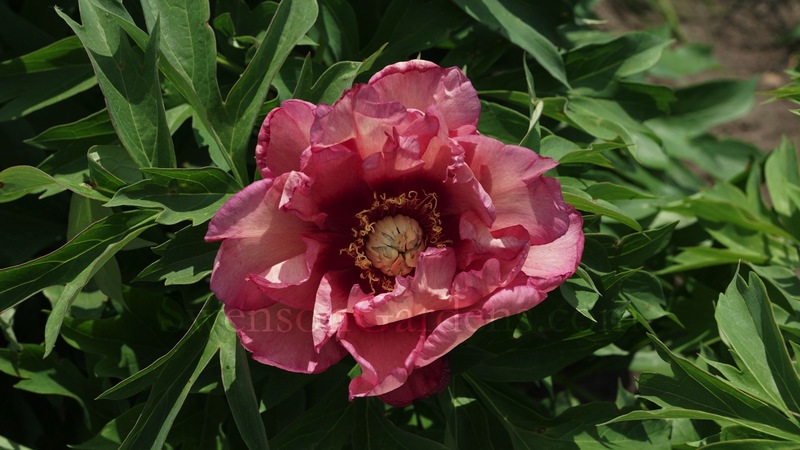 Abalone Pearl was the first coral peony to bloom. 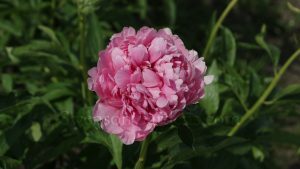 Pink Hawaiian Coral was the second coral peony to bloom. Coral n’ Gold tied for the third coral peony to bloom. Coral Supreme tied for the third coral peony to bloom. 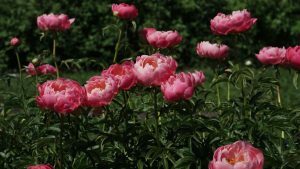 Some of you were able to see one of our top five garden peonies, Etched Salmon. Etched Salmon was almost peak so I just had to take this photo! We truly enjoyed meeting most of you and being able to talk peonies. Make sure to mark your calendars for Friday, June 9th and Saturday, June 10th from 9 am to 5 PM for another visit to Swenson Gardens Peony Field Days! 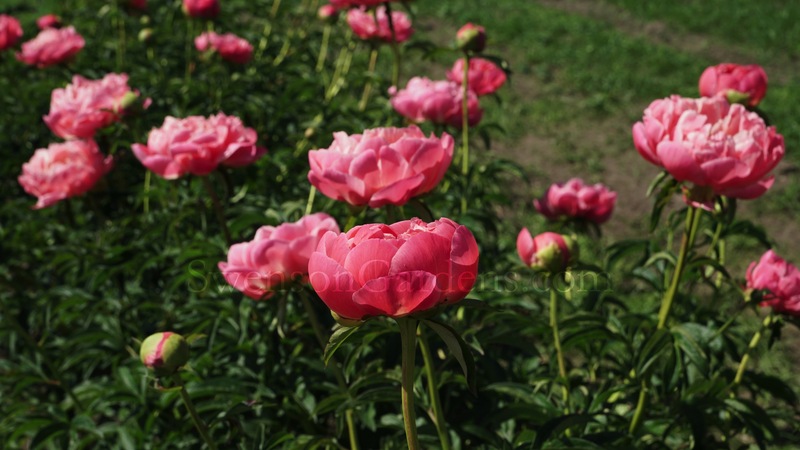 I know a different group of peonies will be blooming and they are anxious to meet you. Thanks again for all of you who visited the peonies today. Yes the weather was gorgeous even though the temps rocketed to 90 F around 3 PM. For Saturday, June 3rd, we will be open from 9 am to 5 PM. Please note we are not open on Sunday, June 4th. Appears some storms are appearing to the west of us over the next couple of hours but the weather forecast looks ok for tomorrow. If storms do develop, check our blog, Facebook or call 763-350-2051 for any last minute changes. So where are we at with blooms? The reds are still at peak including ‘Chocolate Soldier’ and others I posted yesterday. The new garden varieties that opened today include ‘Bess Bockstoce’ in first pic and ‘Petite Elegance’ (one of Becky’s favorites) in the second pic. There are other garden peonies that opened to, but we were quite busy today attending to gardeners in the fields. Color wise we are still at 20% of peonies blooming in the fields. Corals are showing a bit of color and the intersectional hybrid peonies are finally starting to show. A few yellows started as well as Hillary in the photo below. Knowing how crazy this bloom time has been this year, some of you have been calling, emailing and IM when is the best time to come out? We understand you want to know when the fields are at peak bloom, but as of now its looking like the 9th and 10th; however, that could change based on these above normal temps. Always hard to predict when we cannot guaranty the weather, especially temperatures. My suggestion is to still fill up the car and head out this way tomorrow as a week from now most of the early and early to mid varieties will be done. If you can only come out for one visit, you may want to plan for the 9th or 10th, but again this year its not a guaranty! No matter what you decide, we’d still love to visit with you and I know the peonies would like to see you too!